And a really entertaining video expressing the sentiments of so many. Watch at your own risk — there’s strong (subtitled) language. 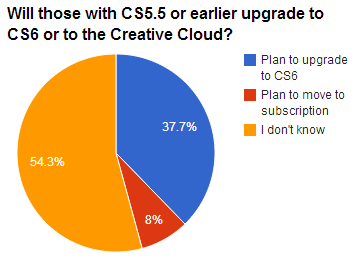 You may have read my first post about Creative Cloud, and I was generally positive about it. But, the more I think about it, the more I’m swinging the other way. What really bothers me isn’t the monthly subscription (as long as it stays where it is) — it’s the fact that if I stop subscribing to the Cloud, I have no software to use at all. It’s not like I will be able to use the software I paid for up until that point. I can use nothing. And that’s a problem. That’s an advantage of the old paradigm (pay a big sum for the software; pay more for upgrades if you want): you always have the software to use, even if it’s outdated. So, while I still acknowledge some positive things about Creative Cloud, I’m beginning to believe that the negatives are far heavier. Let’s see how Adobe handles all this.